Scholar and philanthropist; born 1823 at Minsk, Russia; died there March 10, 1888. He received a thorough Biblical and Talmudical education, was a good Hebraist, and every day for the last thirty years of his life lectured on a chapter of the Bible in his private synagogue. Bampi devoted himself specially to tracing the Jewish religious customs to their sources in both Talmuds and in the Midrashim, and is said to have left in manuscript a work on that subject entitled "Meḳor Minhagim" (Source of Customs). A few extracts from that work were published in the year book "Keneset Yisrael," 1888, ii., and in the "Ha-Kerem." Bampi was on equally good terms with the orthodox Talmudists and with the progressive "Maskilim." 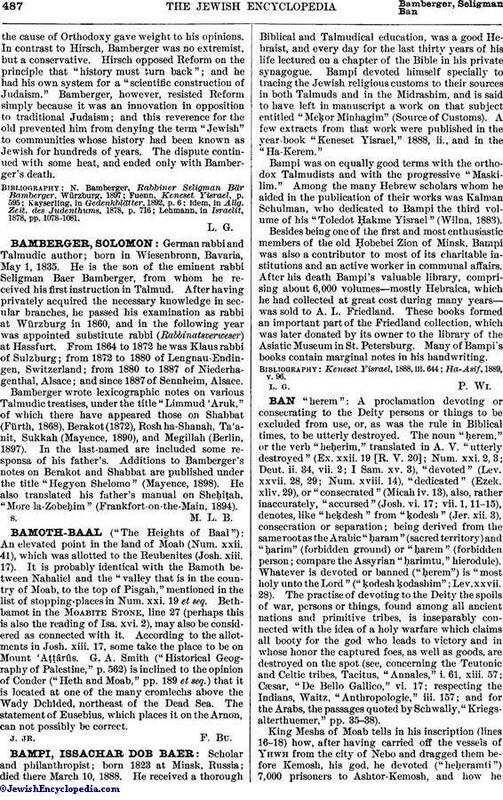 Among the many Hebrew scholars whom he aided in the publication of their works was Kalman Schulman, who dedicated to Bampi the third volume of his "Toledot Ḥakme Yisrael" (Wilna, 1883). Besides being one of the first and most enthusiastic members of the old Ḥobebei Zion of Minsk, Bampi was also a contributor to most of its charitable institutions and an active worker in communal affairs. After his death Bampi's valuable library, comprising about 6,000 volumes—mostly Hebraica, which he had collected at great cost during many years—was sold to A. L. Friedland. These books formed an important part of the Friedland collection, which was later donated by its owner to the library of the Asiatic Museum in St. Petersburg. Many of Bampi's books contain marginal notes in his handwriting.